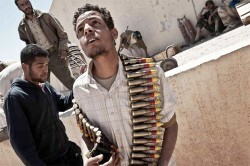 According to a United Nations’ report, Libya has become a center for gun running and gun and weapons smuggling. Because of this, weapons are flowing into Libya from many parts of the world, and from there to many rebel groups in West Africa and even to gangs in southern Europe. The reason for this is not hard to find. Libya has no real central authority. Two years since the end of Muammar Gaddhafi’s regime, the Libyan rebels, who are made up of tribal and town militias, continue to hold real power in their areas of the country. The government, or what passes for one in Tripoli, has no control over these militias and therefore cannot stop the flow of weapons. The flow of weapons has caused extreme instability in western Africa. The classic case is the country Mali. Because rebel Tuareg tribes were able to get all kinds of weaponry from Libya, the Tuareg rebels were able to defeat and almost destroy the Mali national army. Then the Tuareg rebels were pushed aside by Al Qaeda-linked groups who themselves were heavily armed with weaponry from Libya. It took the efforts of the French armed forces and a newly reorganized Mali army to rout the Al Qaeda rebels and the Tuareg rebels. This effort cost thousands of lives, and France of considerable money. Worse, Libya has become a buyers’ market for illegal weaponry and ammunition. Many rebel and Al Qaeda-linked groups are able to buy the weapons they need for their operations within and outside of Africa. Since there is no real central authority in Libya, it is impossible to track where all of this weaponry goes. Weaponry bought and sold in Libya have been found in the hands of rebel groups in Syria and also in the hands of groups like Hamas in the Gaza Strip. As much as Gaddhafi was a brutal and cruel dictator, he had kept Libya stable. He had kept the country from being a place for terrorist and rogue groups, and weaponry certainly did not flow through Libya as it does now. The western powers Great Britain, France and the United States that helped the Libyan revolutionaries to overthrow Gaddhafi did not help create a viable, stable government. The result is what we see now. France has recently come to grief trying to fight the Al Qaeda-linked group Ansar Dine in Mali. It is because France helped overthrow Gaddhafi that Ansar Dine was able to take over half of Mali and kill thousands of innocent people. We may all still pay a price for what British, French and American actions wrought in Libya.